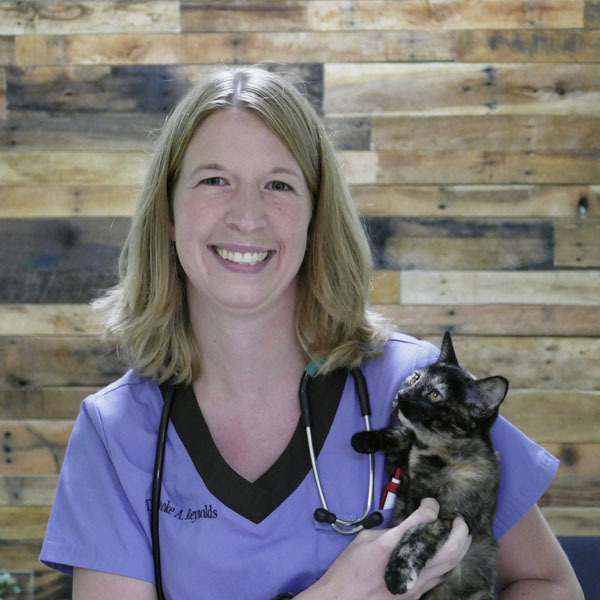 Dr. Brooke Reynolds grew up in a small town in Pennsylvania knowing she wanted to be a veterinarian since she was 5 years old. She received her B.S. degree in Animal Sciences from Penn State. She went on to study veterinary medicine at the Virginia-Maryland Regional College of Veterinary Medicine and graduated in 2012. Dr. Reynolds has a special interest in soft tissue surgery and internal medicine but her true passion is dentistry. She has completed extensive training in both canine and feline dentistry and oral surgery under the direct guidance of a boarded veterinary dentist. She is a member of the Veterinary Dentistry Academy. In addition to extractions, Dr. Reynolds is able to perform a wide variety of advanced procedures from jaw fracture repairs to tooth saving procedures. She is actively continuing her training so she can provide the best oral care possible to her patients in general practice. She lives in Harrisburg, NC with her husband Aaron, daughter Penelope, and their two dogs Loki (lab/husky mix) and Layla (pitbull/boxer mix).